This construction video will provide information on the road camber and its types. Road camber refers to the slope that is arranged in crosswise direction in highways. There are three types of road cambers like sloped camber, parabolic camber and composite camber. 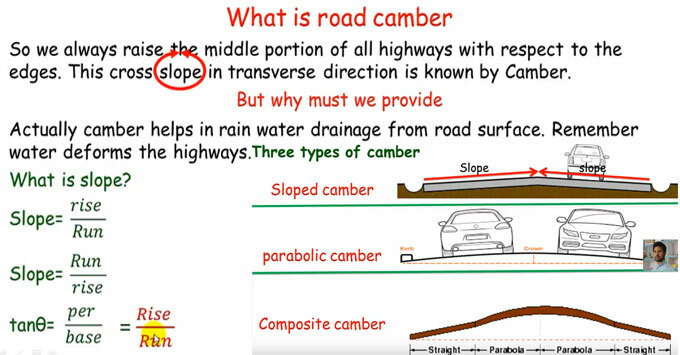 Camber is useful for discharging rain water from road surface as rain water can distort the highway. Therefore, the middle portion of all the highways is upraised relating to the edges and it is called as crown. The cross-section shape of the transverse or cross slope may come in different shapes like curved, straight or an amalgamation of both. The cross slopes are stated in slope as 1 in n or in percentages as n% (as for instance, 1 in 50 or 2%). The design values of cambers are primarily dependent on the type of the pavement as well as on the average amount of the rainfall in the area. Normally, cambers of slope 2 to 3% are arranged. On straight sections of roads, shoulders are arranged with greater cross fall as compared to that of the carriageway by 0.5%.  Safeguard of the road surface, specifically for the roads formed with gravel and bituminous by discharging the surplus water as fast as possible.  Safeguard of the subgrade by arranging proper drainage conditions.  To maintain safety, as drench roadway conditions are quite unwanted for harmless driving.